The Ohio State synchronized swimming team succeeded in securing their 31st national championship last March. While the team was elated to bring this championship back to Columbus, the program is working just as hard this offseason to continue the success. Head coach Holly Vargo-Brown is excited to welcome the new class of Buckeyes into the tradition and excellence of the program. “We are incredibly excited to welcome this fantastic group of young women to our Buckeye family,” said Vargo-Brown. “Together, they bring a wealth of impressive talent and experience. I have no doubt they will make this program even stronger throughout their collegiate careers. These talented student-athletes hail from coast to coast and beyond, and have dominated in their sport and academics. Learn a little bit more about the impressive class of Buckeyes below. A US National Team member from 2012-2017, Carrasco brings her passion for synchronized swimming to the university this fall as she pursues a degree in Criminology. After graduation, Camryn hopes to perform in the show ‘O’ in Las Vegas. The sport has roots in her family, as her mother was a synchronized swimmer who won a Gold Medal at the Olympics. Carrasco spent years training with the elite Santa Clara Aquamaids along with fellow Buckeye Nikki Dzurko. Dzurko brings her talents from the West Coast where she trained for 8 years with the Santa Clara Aquamaids. Dzurko has had an accomplished career as a young athlete; in 2018 alone she claimed 5 National Championship titles at the US Junior National Championship and the US Senior National Championship. She also claimed the solo, duet, and figure titles at the Primorie Cup in Croatia. She describes her greatest sports thrill as competing as a member of the US Senior National Team at the 2017 FINA Aquatic World Championship in Budapest. She says it was an honor to compete at the highest level possible representing the United States and an unforgettable experience competing against Olympic Champions. An Ohio native, Lichter swam for the Santa Clara Aquamaids, Dayton Aqua Gems, and Ohio Synchro throughout her swimming career. Most recently in 2018, she was a North Zone Solo Champion and earned 5th Place at U.S. Nationals in Solo. Buckeye roots run deep in her family; her father was the Head Coach of Strength and Conditioning under Jim Tressel, her grandmother was the Head Synchronized Swimming Coach for 17 years with assistance from her mother. 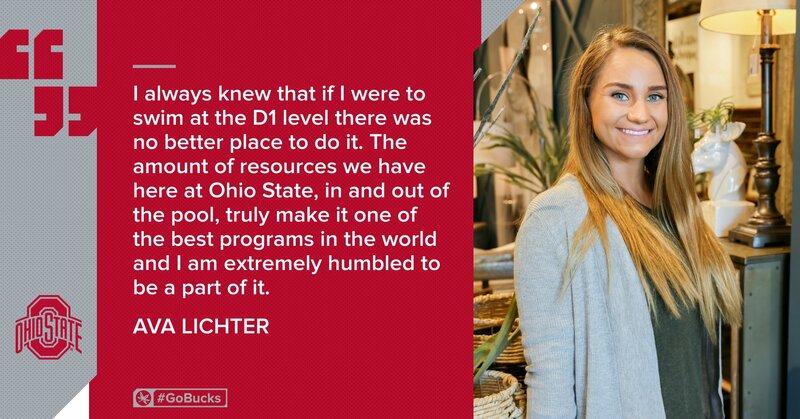 Lichter is continuing the tradition of Ohio State excellence in her family swimming for the Buckeyes this year. Luis assumed many leadership roles during her athletic career in Puerto Rico. She was the MVP of her high school’s swimming team all four years, captain of the Caparra Country Club team, and was named the captain of Puerto Rico’s National team from 2015-2017. She boasts two medals from the 2016 UANA Junior Pan American Championship in tech duet and tech team. She hopes to utilize her major to study tax law after graduation and continue to volunteer with Special Olympics in Puerto Rico. Cassandra Neeley brings her multitude of talents to Columbus after competing in swimming, diving, and synchronized swimming throughout high school. With a long list of accomplishments, Neeley most recently earned a spot on the 2018-2020 Olympic Training squad. She has been named the Junior Olympic Figure champion, Junior Olympic Solo champion, and Junior Olympic Combo champion. Neeley is well prepared for life as a collegiate student-athlete as she dominated in her sport while remaining an honor roll student throughout high school. Patton competed for Vermilion High School as a member of the swim team and garnered Second Team-All Conference status. She also trained with the Ohio Coralinas Synchro and Brecksville Blue Dolphins teams. She was awarded third in Solo at the 2018 US Junior Olympic Championship and was an East Zone All Star team member. She hopes to utilize her Ohio State education to attend medical school and become a neurologist. Stremlaw comes to Ohio State from Ontario where she was a member of Team Canada from 2015-2018. In 2018, she was a member of the French Open Synchro Championship team and was a Gold Medalist at Nationals in Junior Free and Junior and Senior Tech. She comes from an athletic family; her dad was a member of Team USA for hockey and her mom was a national stream synchronized skater and national champion trap shooter. Her academic accolades are equally as impressive. She received High Honors Academic achievement in all four of her high school years. Another West Coast addition to the team, Watson joins the Buckeyes this fall to pursue a degree in Psychology and train with one of the best programs in the country. She boasts an impressive list of accolades including US National Team member, US National Champion, and Swiss Open Team Champion. She trained with the Walnut Creek Aquanuts from 2007-2018. Upon graduation, Watson hopes to utilize her degree to become a therapist. Look out for the talented Class of 2022 to make an impact in the pool this season.